The wonder and beauty of Lewis Ginter Botanical Garden never cease to amaze me each time I visit. But sometimes, I need to remind myself to slow down and take in the smaller details around me. Rushing along the Lotus Bridge or the Main Garden Walk means I’ll miss creatures in the water and new blooms. So spending a hands-on day with a group of students from the MathScience Innovation Center’s Project RVA program reopened my eyes to the excitement of a first visit here. Turtle-spotting on the Morning Dock in Lake Sydnor. 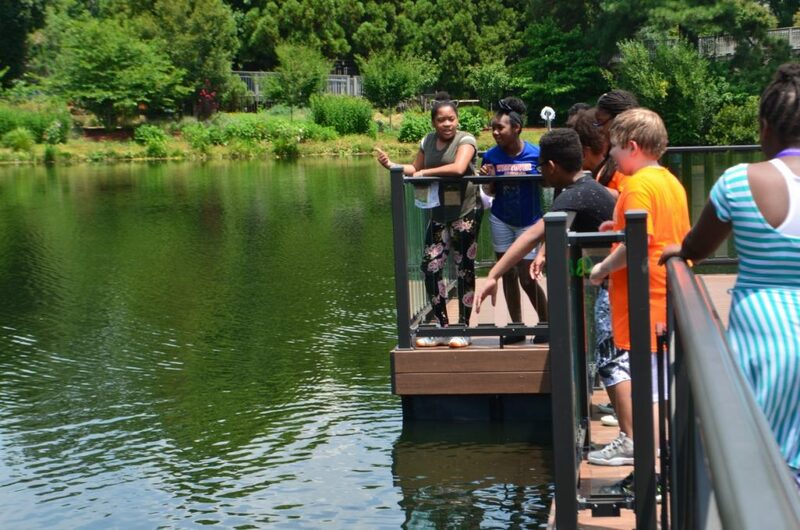 Most of the twelve 6th-graders wouldn’t be able to take part in this experience through their schools, but Project RVA, established five years ago with a grant from the NASA Space Grant Consortium and funded by Altria Client Services, allowed them to do so. 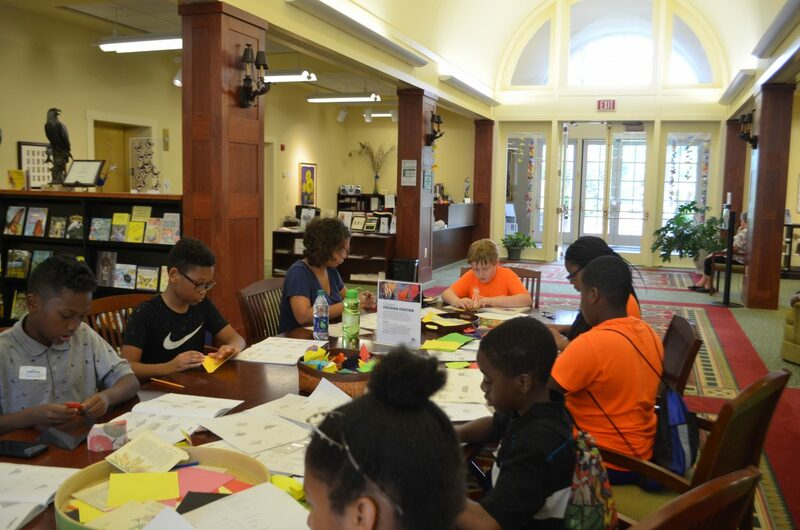 The program provides Richmond-area middle school students with in-depth learning and research opportunities they may not experience in a traditional classroom. 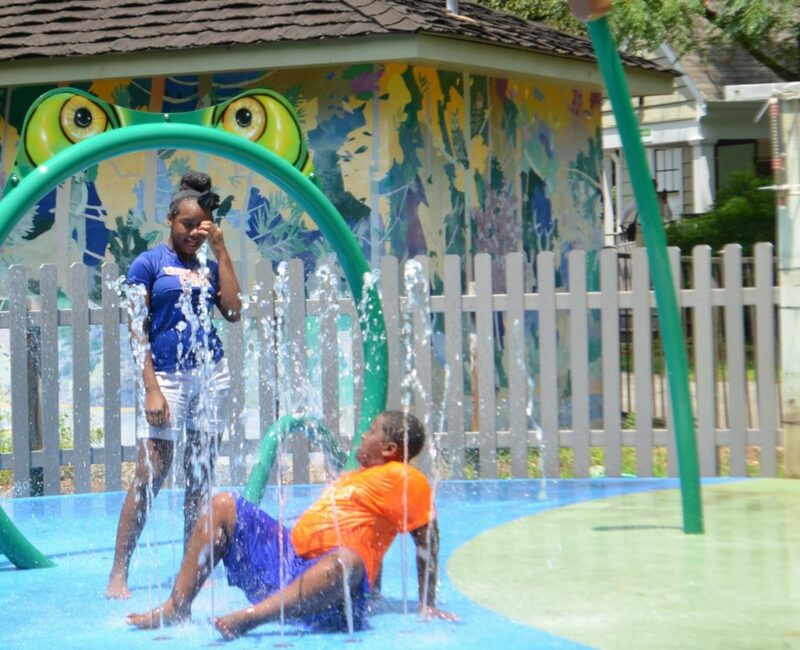 Making the most of a sunny day at Waterplay. 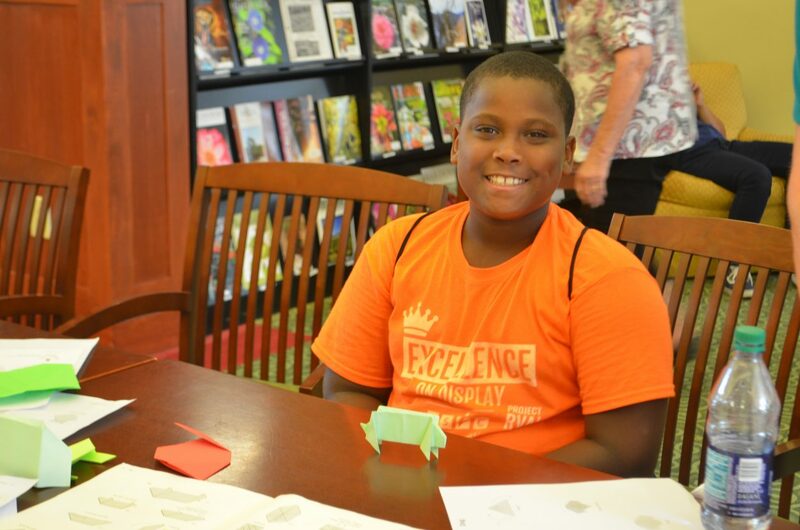 “Through data analysis, we found that students that participate in competitive STEM fairs in the Capital Region are coming from just a handful of schools and underrepresented students rarely participate,” said Andrew Derer, coordinator for Saturday, summer, and special programs at the MathScience Innovation Center. He explained that the program hopes to increase these students’ representation in such events from “rare to occasional to frequent.” The program selected students for this opportunity through an application process with a teacher recommendation. Project RVA’s visit began in the Children’s Garden, where the group ate lunch, then took some time to cool off in WaterPlay. On their tour, they raced down the shady trail of the Margaret Streb Conifer Garden, down the floating docks bobbing on Lake Sydnor, and into the Garden Keeper’s Cottage. They were the first to spot fish and turtles in the water, and a lizard darting between a log formation. Sweeping out the walkway to the Garden Keeper’s Cottage. Looking for lizards while leaping across logs. The group studied steps carefully to make a variety of creations. 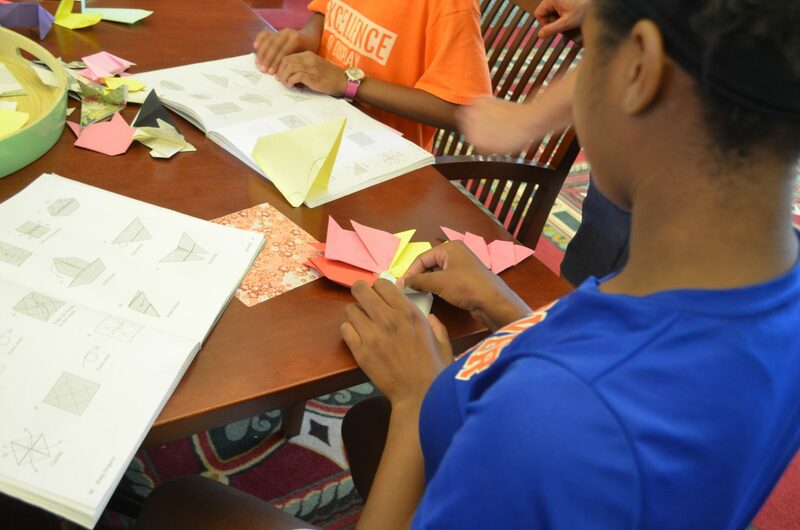 Assembling a bouquet of paper blooms gives another meaning to “hands-on education”. Their visit ended with a trip to the M&T Bank Butterflies LIVE! exhibit. 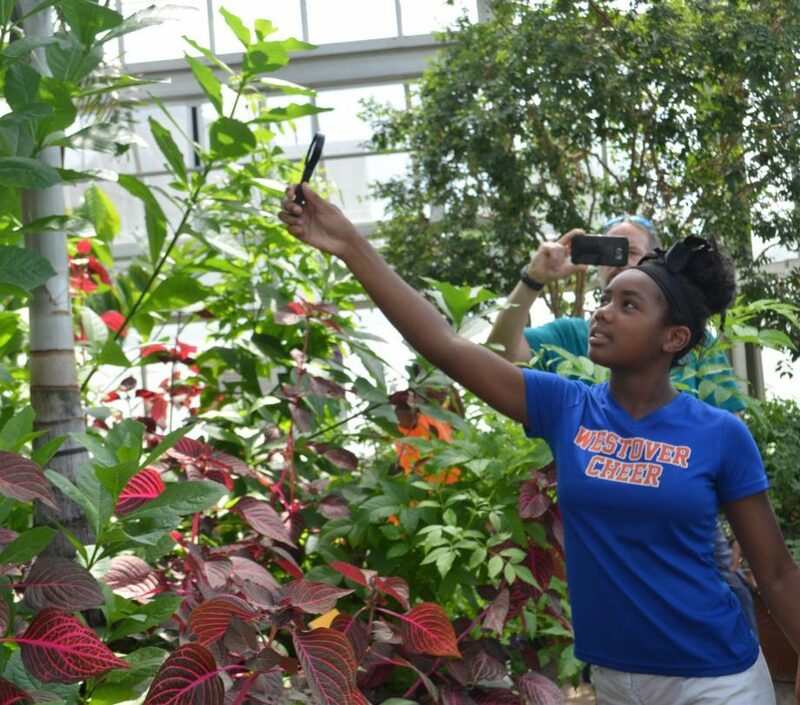 Students who had never been to the Garden before were excited to walk under the large glass dome of the Conservatory. 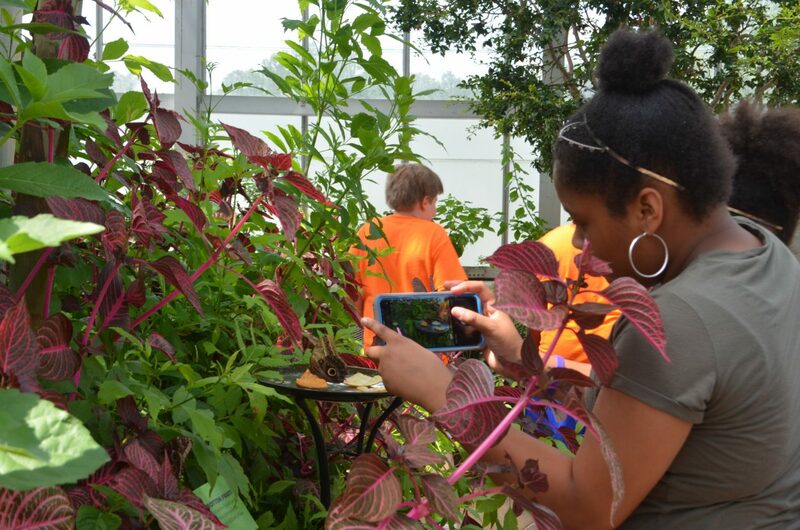 Students found unique ways to engage with the butterflies fluttering through the North Wing of the building, from looking at the butterflies’ life stages to taking pictures to listening in on a migration listening station. 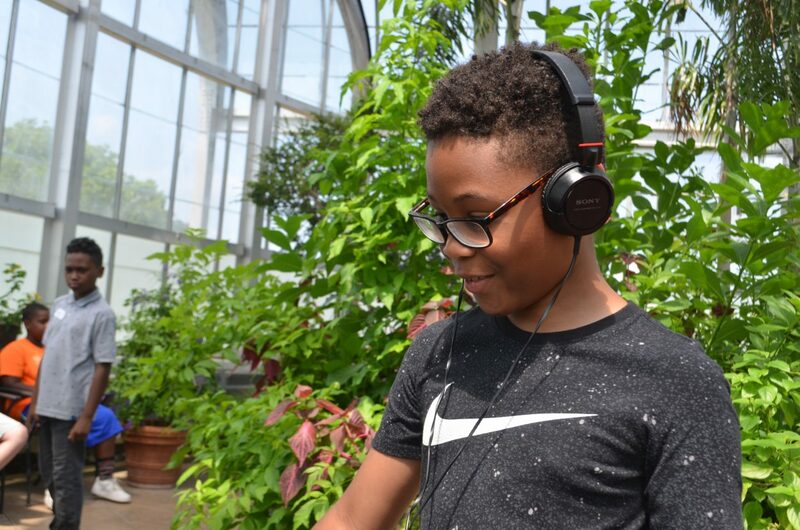 Listening in on A Northward Migration sound installation, all about the science of butterflies. Reaching for the sky to get a closer look at a butterfly. 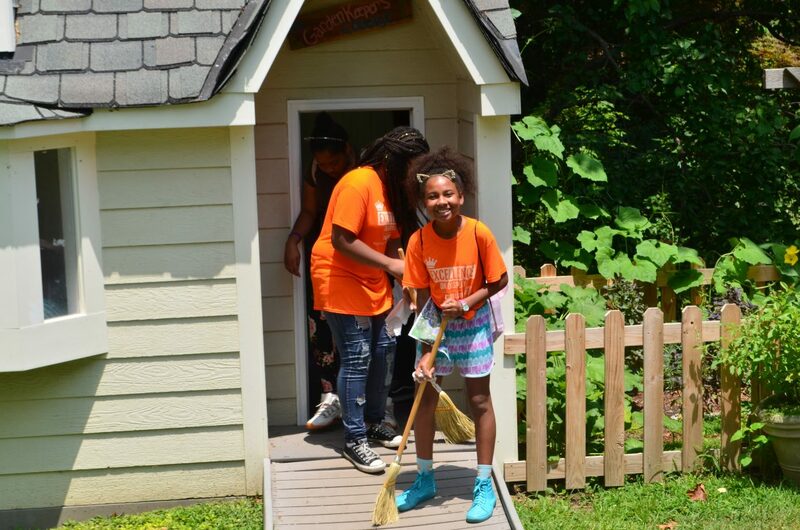 Lewis Ginter Botanical Garden is just one of several Virginia locations the students will visit this summer—others include York River State Park, Tricycle Gardens, and other environmentally-based outings. It aligns well with their summer learning, which has covered experiments on soil and plant growth. The students are also delving into community issues, like food deserts and nutritious eating options. These are a perfect match for the Garden’s mission of connecting people through plants. 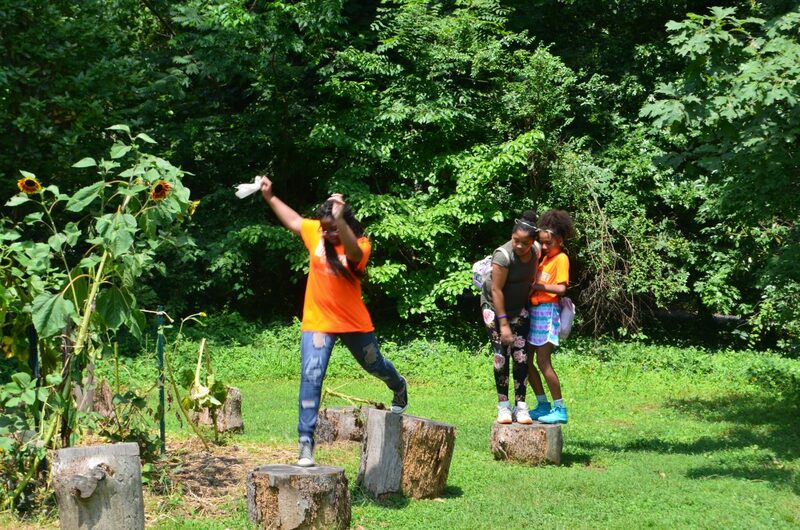 Whether working with the Beautiful RVA coalition to train Ginter Urban Gardeners or establishing the Kroger Community Kitchen Garden, Lewis Ginter Botanical Garden has become well-known for its community engagement in the Richmond Region. 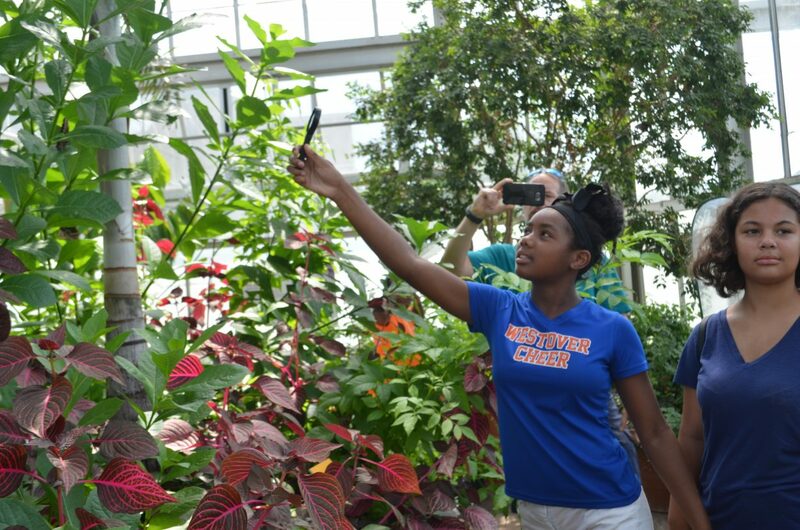 Sharing the experience of these bright, funny students has been a highlight of my summer here at Lewis Ginter Botanical Garden. Judging from their curiosity and huge smiles, I think they got great ideas for their projects. I can’t wait to see the outcome of their care for their communities and growing interest in the natural world. Claire Jeantheau, the summer Public Relations/Marketing Intern at Lewis Ginter Botanical Garden, is excited to use her background in writing and social media to tell the stories of the green spaces here she loves. She currently studies classics and social entrepreneurship at Dickinson College. See a 5-minute movie about the Ginter Urban Gardener program through Beautiful RVA. A premier art exhibit of origami bronze, steel and aluminum sculptures.